Some good news for grassroots football at the launch of the new Premier League season today with the announcement of a new scheme to benefit budding young footballers. The Premier League Players' Kit Scheme will provide £500,000 worth of kit and equipment for children in England and Wales, funded by players of all 20 Barclays Premier League clubs. The fund will benefit Under 16s clubs, schools and youth organisations, particularly those from areas in most need of assistance. A joint initiative between the Premier League and the Professional Footballers' Association - who will manage and administer the running of the scheme - the scheme will be funded by a £25,000 donation from each Premier League squad. Chelsea captain John Terry said: "As someone who benefited from grassroots football I know how important it is to have the right kit and equipment. Not all kids can have access to that, especially those from deprived areas, but hopefully the Premier League Players' Kit Scheme can help. "It's fantastic that all the players in the League are clubbing together for this. Hopefully a little of that Premier League magic will rub off on those pulling on the shirts and we'll see a few of them pulling on a real Premier League jersey in the not-too-distant future, but the biggest thing is having the opportunity to get out and have fun playing football." PFA Chief Executive Gordon Taylor said: "Our members do much more than entertain fans on the pitch and I'm proud of the fact that players donate so much to charitable causes. This is a new initiative for our players to be involved in but it is one I hope will encourage more tens of thousands of young people to participate and enjoy football." The Premier League Players' Kit Scheme will provide successful groups with a free Nike team strip. Any club, school or youth organistation can apply. There are a limited number of strips available, so the scheme will operate a competitive application process. Bodies applying for the kit will only be eligible to receive one team strip, irrespective of the number of teams they operate. Team strips will only be awarded to those who fulfil all of the criteria and priority will be given to those that come from areas that are deemed to be in most need of assistance. • Hold appropriate Public Liability Insurance. 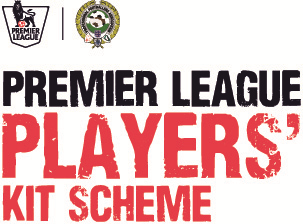 To apply for the Premier League Players' Kit Scheme, please click here. Kits will be available to successful applicants from October onwards.